On a recent Friday night, we decided to give the recently opened Lonnie's Fusion Cuisine a visit, hoping for a nice dinner. We were not disappointed. The food was decent, the atmosphere pleasant, and the waitstaff good. Lonnie's Fusion Cuisine is a rather small but intimate place inside with the supposed look and feel of a cafe in Europe, I'd guess. Inside maybe seats a total of 30 people or so if every spot was taken, but in nice weather, there is also some very pleasant outdoor seating. We were there on a rather cold winter evening so it was definitely not an outdoor kind of night. We entered and were quickly greeted and seated in a spacious booth. In a short time, our waiter appeared and took our beverage order. 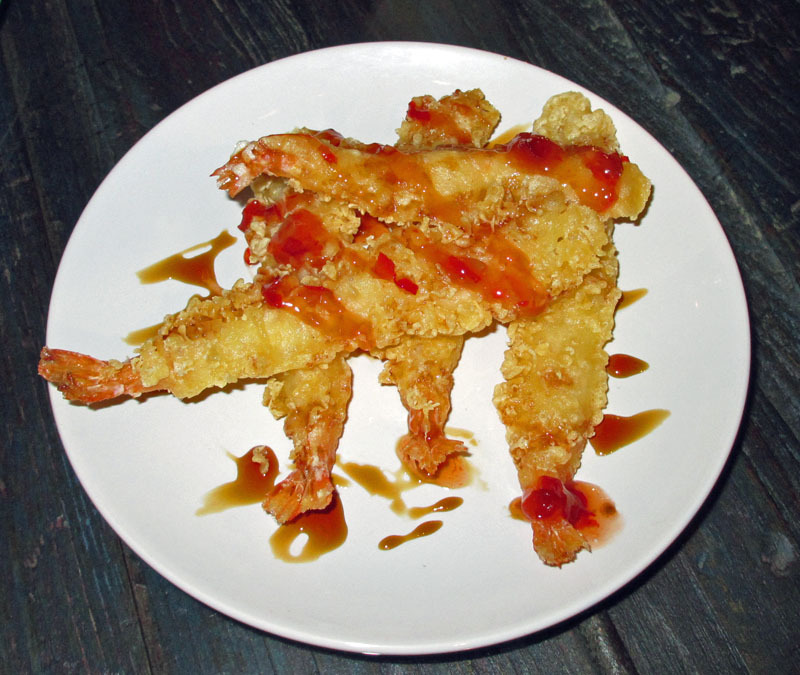 For starters we just had to try the Fried Shrimp Torpedo. Actually, there were five torpedos. Shrimp (more likely prawns) were stretched out long, like torpedoes. There were five of them that were nicely breaded and deep fried, then topped with a bit of sweet chili and oriental sauce. I'd have liked just a bit more sauce, but my friend Tommy thought it was just right. I guess I like a bit more heat. Nonetheless, they were delicious, cooked perfectly, not greasy, and the bit of sauce gave them a nice flavor without overpowering the flavor of the shrimp. They were delicious and I'd order them again, in a minute! We started our meals with a salad. 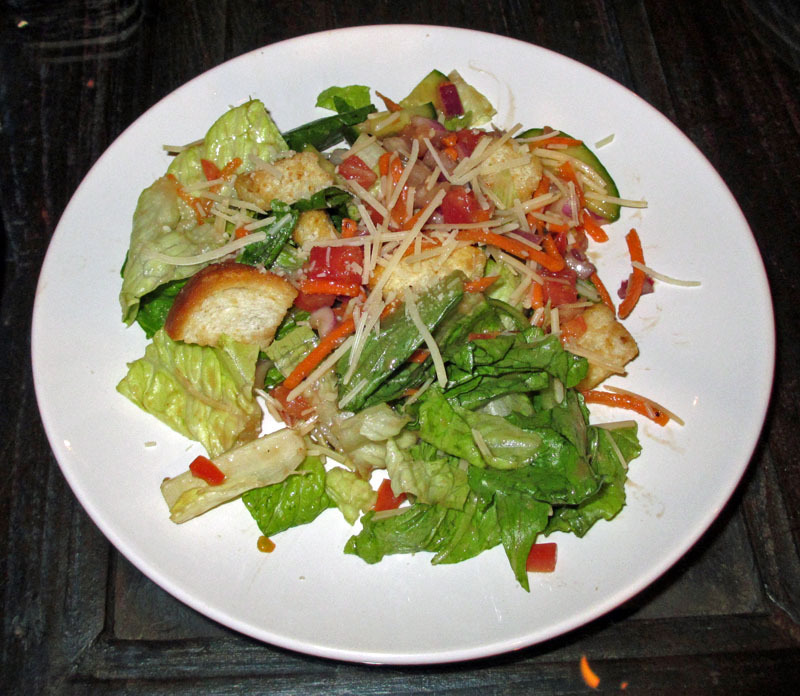 It was a fairly typical salad for a nice restaurant with romaine lettuce, a bit of carrot julienne, some tomato, cucumber, croutons, and a bit of cheese. I had the balsamic vinaigrette dressing. 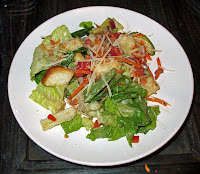 It was a good salad, all that a salad should be and not over-dressed either, a pet peeve of mine. It was light, fresh, cool, and delicious. For my main course I ordered the Champagne Chicken and Mushrooms. It was a great choice as it turned out.It was pan seared medallions of chicken that were nice and moist and tender. They were served over some smashed garlic potatoes (but not too heavy on the garlic, thankfully) with a mushroom champagne sauce that was velvety in texture, and rich and flavorful. I really liked this dish. The chicken was oh so tender and juicy. The poatoes were creamy without being pasty. And the champagne mushroom sauce was a real delight. 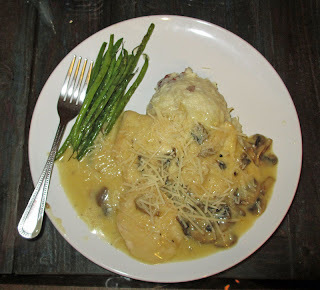 It was served with a choice of a side and i chose the Sauteed Garlic Green Beans. I'll say that the portion of beans was a bit meager, but they were delicious and tender, cooked well but not overdone. This was a real hit with me and I managed to eat every last bit of it. For his main course, my friend Tommy had the New York Strip steak. It was a 12 oz. 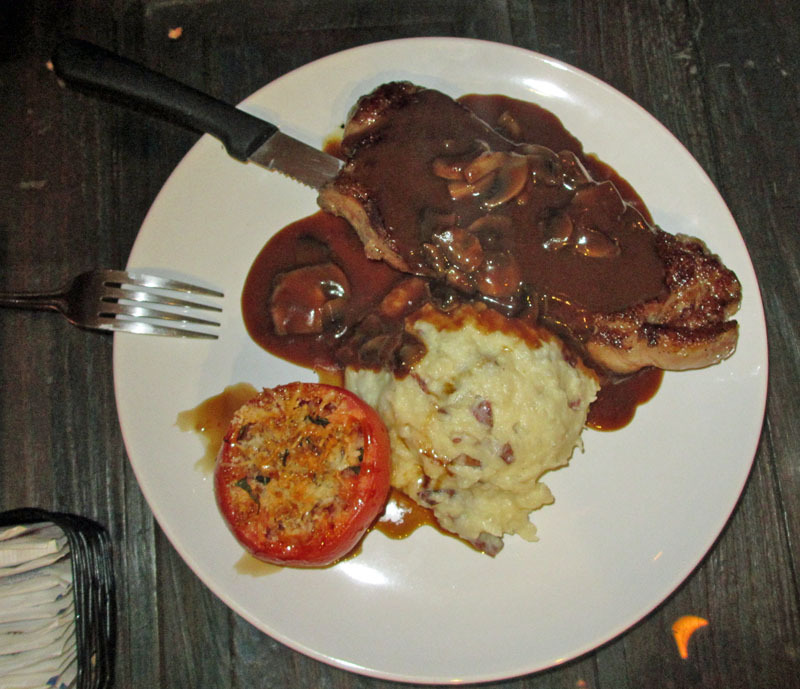 Angus New York strip steak, cooked perfectly to the requested medium rare, iron seared (whatever that really means) served over smashed potatoes and covered with a mushroom demi glaze sauce. The steak had a very nice flavor though it was just a bit chewy. Not tough, but just not butter-tender either. Still, it was flavorful and delicious as were the potatoes and the demi glaze. For a side he had the Roasted Stuffed Tomato and it was really good, a tomato that was topped with some bread crumbs and cheese and roasted. It came out piping hot but was oh so delicious and the lightness and acid of the tomato added a nice balance to the heavy richness of the demi glaze. My only complaint overall is the price of the wine. It is not cheap here. I had the house Cabernet Sauvignon and it was $9 a glass which, in my estimation, is just a bit steep. If I was to consider coming back, that is one item that might make me think twice. Or I'd go again with a resolve to just have a soft drink--and I like a glass of wine with my meal. Our service was pretty good. I'd guess that our server was rather new and didn't know all the answers to our questions, but he did find out when asked. Also, it appeared that the owner maybe or at least the head chef was in evidence, i noticed him taking care of things, talking to guests, etc. He even asked us how our food was. That's always nice to see. So my first impression of Lonnie's Fusion Cuisine is a favorable one. I see that they have some fairly decent priced lunch items, and I'm sure I'll return one day with a few coworkers and give it a try at lunch time. First impression was quite favorable, so I'd return again, though maybe not when in a wine mood. Then have only been open a few months, but I'd say they are on the right track. Give them a try, I recommend it. We headed to the newly opened (less than a month) BurgerFi in Lake Mary on the day before New Year's. I was hoping for a "Five Guys" type of burger experience. 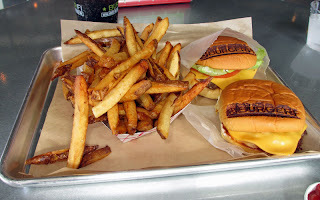 I really wanted to like BurgerFi and hoped for a mouthwatering, juicy burger. Though their web site says that BurgerFi is "changing the way we think of the burger," and that they are "guaranteed fresh, juicy, and delicious," I was, unfortunately, not impressed by the burger. For a place that has "burger" in its name, the best thing I had were the French Fries. A regular size order of fries was almost too much for the two of us to eat. They were indeed fresh, hot, and delicious. And, at $2.77, they were quite a bargain as well. But then we come to the burger. I was not all that hungry so I ordered a single cheeseburger with lettuce, tomato, mayo, and mustard. It cost $4.97 which seemed a bit rich. The bun itself was tasty and delicious. The lettuce and tomato were fresh and crisp. But bun has the BurgerFi name seemingly branded on the bun top, and the bun was toasted. But the burger that was in it was not juicy, it was rather dry and only warm. On top of that, the bun was slightly cool to the touch. Now I'd expect that maybe of the top bun because there was lettuce and tomato under it, but the bottom bun too? I can't quite figure it out. My guess is that the buns were pre-toasted and that it was allowed to cool down to room temperature. But even the burger was not overly hot. The order could not have sit very long because it was as scant five minutes from the time we ordered until we got our order and the fries were very hot. So I was a bit disappointed in this burger. I've had equally good burgers at McDonald's, I'm afraid, much more juicy and moist. Now, will I give them a second try? Yes, I will. As I mentioned, they've been open less than a month. Another observation. There did not really seem to be anyone in charge. There were employees from the grill (I think) hanging around the front counter. Later there was an older gentleman in the front--he appeared to be training a cashier. There was a very friendly gentleman who was keeping tables clear and the dining room clean--he was plenty friendly. I believe that when you have a fast food operation that depends on a bunch of young people, you really need evident and direct leadership, making sure they are all busy and not just "hanging around." But, as I said, it's new, they're just learning. I'll give them a month or two more to adjust and then try it again. For now I'm voting "don't like" because if you have "burger" in your name, then the burger should shine--mind didn't. But I suggest you give them a try and see what you think. Let me know! And I reserved the right to change my vote after a future visit. I wish them well and hope they improve. We could use a good burger joint in Lake Mary.